The seal lip protrudes .300. Yes, it might be a little tight. I believe I removed a bit of material from the pulley for clearance on mine just in case. I'll check a couple of different seals that I have. Nice picture of a daisy seal flower BTW! Randall, check out some other seals. I think Chaffin sells a SKF seal #11740 and I have a CR 12458 that is close to .200" wide! The CR seal has a pretty good fit on my crank, It maybe a bit too large but it doesn't take much. There must be quite a selection by looking online sites. I've FOUND THE Timken web site is very good to research sizes. After pushing 2 felt seals in the grove under the crank, using a model "A" rope seal in the top of the crank, and gluing a modern seal to the outside, I still get oil out the front of the crank. I have one of those high volume outside oilers. I used the rope seal from Lang's, part number 3012R when I re did my engine. No leaks. Dennis, I believe yours is the first time I've heard of the modern seal leaking. 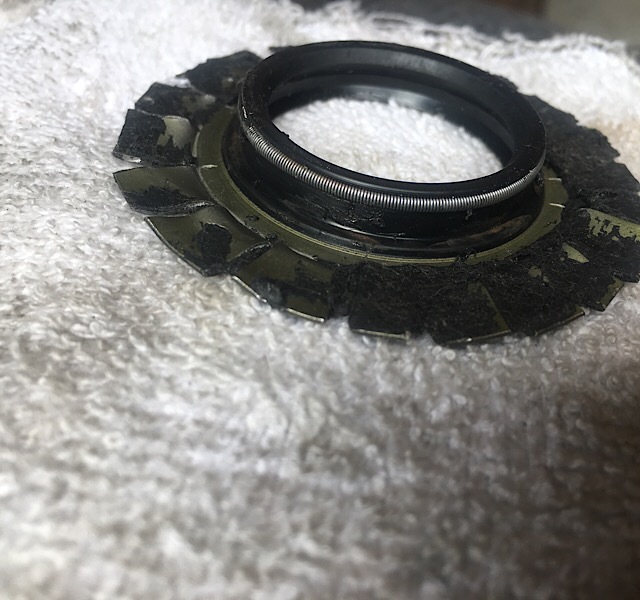 I suspect possibly the engine surface wasn't cleaned oil free, the seal might have been fit a little better, or you didn't use Permatex Ultra Black or the Right Stuff. Possible surface pits or damage could also be an issue. These modern seals do an amazing job of preventing the oil seeping around the crank shaft. Even if the shaft area is not perfect condition they still work magic most of the time. Sorry to hear you weren't successful.